When a headstrong chef takes charge of her equally stubborn 8-year-old niece, the tensions between them mount... until an Italian sous-chef arrives to lighten the mood. 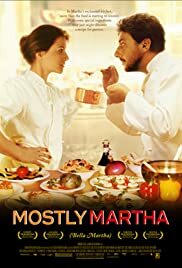 Mario: [to Frida, about chef Martha] It's your restaurant, but her kitchen. Without her, it's just a pile of metal. It's for her to decide. his music, and that alone would be enough.